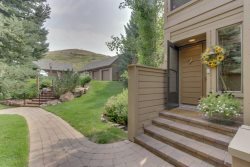 With Baldy Views, Air Conditioning, and in easy walking distance to Downtown Ketchum and River Run Ski Lifts- this immaculate Westridge Ketchum 2 BR / 2 Bath Modern Condo is a fantastic spot for ski or summer Sun Valley vacations. The 1,200 SF condo features an open floor plan allowing for stunning mountain views from the Kitchen, Dining and Living Areas as well as the Master Suite. LIVING AREA: With stunning Views of Baldy, relax on the L-Shaped Sectional in front of the Flat Screen TV and Two-sided Gas Fireplace. Sliders lead out to the Furnished Balcony with Gas Grill. MODERN KITCHEN: Overlooking the dining and living areas, the kitchen is fully equipped with Williams-Sonoma tools necessary for a gourmet meal. Hop up on one of the two bar stools for casual countertop seating for a quick snack before hitting the slopes. DINING AREA: The dining area comfortably seats 6 and is adjacent to both the Living Area and Kitchen. MASTER KING SUITE: Wake up to Baldy Mountain views from the comfy King Bed with Down Filled bedding. On cold days, turn on the Gas Fireplace and watch your favorite movie from the Flat Screen TV. The luxurious Ensuite Bath with Dual Vanities, Jetted Oversized Tub and separate Glass Shower feels like a spa retreat. GUEST QUEEN BEDROOM: Caddy corner to the Master Suite for privacy, the guest bedroom is well appointed with Down Filled Bedding. The guest bath, located in the hall, features a shower/tub combo. ADDITIONAL AMENITIES: include Air-Conditioning, WiFi, Washer/Dryer, Underground Parking for (1) Vehicle, Gas Grill, (2) Bikes available for Guest use and a Hot Tub on site.